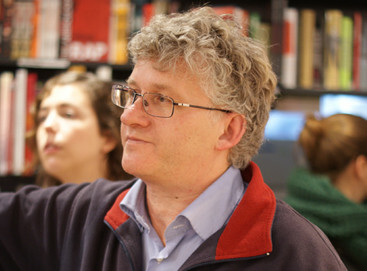 Rick Lightstone is PR director at the ABC bookstore in Amsterdam and has been in the Netherlands for 28 years. If he had to leave, he would cycle down the Amstel into the sunset. I met my wife on a kibbutz in Israel. She is Dutch and wanted to live in Holland. We were in Vancouver for a few years and after moving back and forth a bit, we ended up here. That’s a tricky one. I’m a Dutchified Canadian. I went to Dutch language schools for a while. At home we speak primarily English and my kids have grown up to be completely bilingual. I’m not going to say Indonesian. Does it count as Dutch? I guess bitterballen. Every time we host an author at the ABC they freak out about stroopwaffels but I don’t really get them. The space and the nature, the mountains and being able to get away from it all. I don’t miss that much about Canada… not any more. Things change when you’ve lived away for so long. I’m pretty integrated into Dutch culture. We followed all the Dutch traditions at home when the kids were growing up. Of course, I cycle everywhere. I’m completely used to living here. Sometimes you just don’t remember how things were before. I’d have to say the Rijksmuseum since its renovation. I just love the building and they way they exhibit everything. It is the most extraordinary place. There is one thing which still stands out, and which I really hate, and that is the party format at peoples’ homes. You have to sit in a circle and this makes it very hard to begin a conversation with someone. In the US or Canda you would introduce yourself. Here, no one asks you what do you do for a living and there are no openers at social gatherings. It is much more difficult to initiate conversations. That was very frustrating in the early day. Now I just jump in. I don’t care any more. I’d take my bike and cycle down the Amstel river and I’d be gone the whole day. I’d take a picnic and ride off into the sunset.